Mayor Hilberto Campos, Corozal; Mayor Nicholas Ruiz, Benque Viejo Del Carmen; Mayor Aaron Gongora, Dangriga; Mayor Floyd Lino, Punta Gorda; Mayor Elsa Paz, San Pedro; Mayor Zenaida Moya-Flowers, Belize City. The team were in the UK for the Commonwealth Local Government Conference in Cardiff, but went on to a major programme of high-level visits in London. Also attending the conference was a team from the Ministry of Labour, Local Government and Rural Development made up of Minister Hon Gabriel Martinez, CEO Mrs Marion McNab and Mr Celso Carcamo (Local Government Officer). 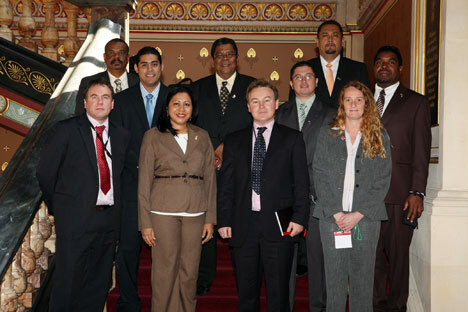 The Local Government Conference was held at the City Hall in Cardiff, Wales from 15 to 18 March 2011. Hosted in the city for the first time, the theme of the Conference was “Energising Local Economies; Partnerships for Prosperous Communities”. It presented Cardiff Council with the opportunity to share international knowledge with delegates from 54 Commonwealth countries. More than 500 delegates attended, with Belize providing one of the larger delegations, including Ministers, Chief Executives and Senior Local Government staff. The Conference provided a platform for discussion on the role of local government in local economic development and explored ways to maximise opportunities for encouraging prosperous communities. The main areas of focus were youth unemployment, regeneration and education, securing investment, promoting enterprise and funding business support initiatives. This was the first visit to the UK for most of the Mayors. The High Commission was therefore keen to show them the UK’s wealth of private sector experience in delivering services to and for the public sector. In partnership with the Caribbean Council they arranged a full programme of meetings during the team’s second week, which provided a way of identifying opportunities for working with UK companies to address local issues in Belize. It also served to alert UK companies to opportunities in Belize and to build business relationships. The intense three day programme started with a tour of the recently completed massive construction project at the site of the 2012 Olympic Games. The first of their meetings was with Eversheds LLP, an innovative international law firm with legal specialists that operate around the world in sectors including financial institutions, energy, natural resources, food and transport. The discussions focussed on waste management, sanitation, recycling and tourism. A meeting with the Deputy Mayor of London, Richard Barnes, provided an opportunity to share experiences on the difficulties faced at local government level by both countries in areas such as crime, health, education and tax recovery. The meeting with the All Party Parliamentary Group for Belize was well represented by members of both the House of Commons and the House of Lords including Chairman, Lord Foulkes. The Belize High Commissioner, HE Kamela Palma also attended and spoke at this meeting. The second day started with a tour of the Tate and Lyle Sugar Factory who have sourced cane sugar from Belize for over 35 years. Meetings followed with Mott MacDonald, an employee-owned management, engineering and development consultancy serving the public and private sector around the world, and Crown Agents who are an international development company committed to global development and growth gave a presentation on the work they had done on tax reforms in the Caribbean. The Mayors also met with Living Earth Foundation, an established NGO specialising in working with people to resolve their environmental and social concerns, and the South London Waste Partnership - made up of four local councils who are working together to provide improved and more cost-effective waste management services to their residents. The High Commissioner for Belize also joined the Mayors at a meeting with senior officials at the Foreign Office, and hosted a high-level reception for them at London’s Canning House at which she made a short speech welcoming the Mayors to the UK. The visit has been seen as a huge success, and generated a great deal of interest from the UK companies, who were extremely impressed by the level of engagement by the Mayors on key issues relating to Belize.